Lead singer Sam Harris and drummer Adam Levin from X Ambassadors joined the Spirit of Troy Trojan Marching Band for the finale of today's halftime show. We were lucky enough to be on site to watch it live. We recorded it for your and enjoyment and turned it around as fast as possible to get it out to the masses as quickly as possible. 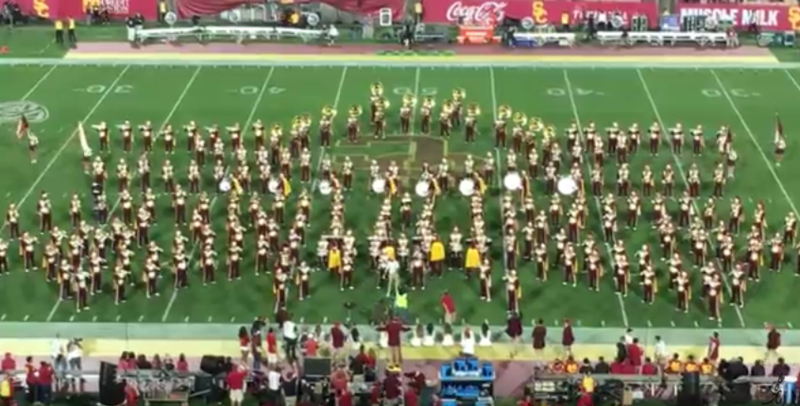 The Trojan Marching Band takes their role as the "Rock Star" Marching Band very seriously. Per their earlier press release, "This latest collaboration will be the fitting coda to a halftime show celebrating The Spirit of Troy’s well-earned status as the rock star of marching bands. The TMB will open the show with songs by artists they’ve collaborated with this year: Hand Clap by Fitz and the Tantrums and Light It Up by Major Lazer. The band joined Fitz and the Tantrums for the encore of their show at LA’s Greek Theatre last month and performed with Major Lazer at the Coachella music festival in April." It sounds like we should hope to expect more performances like this in the future. Enjoy, and share so others don't miss out on this special performance. And here is the full halftime show.